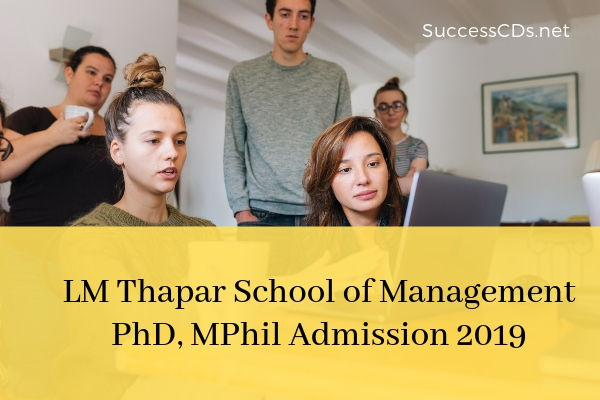 Candidates can check all the details of TM Thapar PhD & M.Phil. Admission 2019 like application form, eligibility criteria, counselling procedure etc from this page give below. All the selected PhD (Residential) and MPhil (Residential) scholars will be offered Junior Lectureship/Research Associateship with a salary/Scholarship of Rs. 30000/-. Opportunity for Paid Research visit to one of the partner University. Opportunity to collaborate with distinguished Professor/Scholar from across the world. Weekend classes for PhD Executive). Candidates must have qualified NET/JRF (UGC/CSIR) or have a valid score in one of the six tests, namely CAT/GMAT/GRE/GATE/NMAT/XAT. *In case the post-graduate qualification is a one-year program (for example ,1-year PGDM), candidates should produce a certificate that their qualification is equivalent to Master’s degree as per AICTE/ UGC or any other statutory authority. The candidates must have a minimum of five years full-time teaching/research/industry experience. The candidates are required to submit the "No Objection Certificate" from their parent organization/department/employer stating that the candidate is permitted to pursue studies on a part-time basis and that the candidate's official duties permit her/him to devote sufficient time for course work and research. In case of foreign candidates, Research VISA endorsed to TIET is required. The candidates who score at least 50% (45% in case of SC/ST candidates) marks in the entrance test as mentioned above and qualify the interview shall be considered for the final selection. The final Merit list for admission to the M. Phil. Program shall be prepared based on the total marks scored by the candidates in the entrance test and interview. Please contact admissions team at Ph.D./M.Phil. : tsm-phd@thapar.edu or call on 01762-394533, 01762-394524.